Applying for college was definitely a difficult experience for me during my last couple years of high school. Since I started high school, I was always very conscious of my actions and how they would impact my collegiate career. I think this is a common experience for first-generation university students. The actual preparing for college, however, started my junior year of high school and it was honestly one of the most stressful periods of my life. Being that both of my parents are immigrants and, therefore, weren’t familiar with the processes of prepping for college, I was pretty much left on my own to figure out how to obtain a postsecondary education. I was searching for colleges, going on college visits, and learning about FAFSA, loans, and other financial-related university materials all on my own. This is not to say that my parents were not supportive of me—they absolutely were—but being 17 or 18 years old and having to make such important life choices with little guidance was frankly overwhelming and stressful. During my senior year of high school, I was accepted into the University of Iowa and directly admitted into the Tippie College of Business. I chose to accept this offer primarily for one reason: the amount of scholarship money they offered me. I wasn’t sure if the University of Iowa was the perfect match for me, but I was absolutely sure I didn’t want to spend my life paying off loans. I also knew that Tippie was a highly competitive, esteemed business school and I was very eager to make new, valuable connections. One of the hardest things about college is choosing the major that will essentially lay the foundation for your upcoming career. I am fortunate enough to have found my passion at a younger age than most. During high school, I was involved in my school’s Student Council which gave me the opportunity to plan a variety of events for the school. This is where I learned of my passion for event planning. I also have always dreamed of being my own boss and managing my own business. With all of this in mind, I decided to pursue a degree in Business Management & Entrepreneurship. Additionally, with some help from my advisor, I also decided to graduate with a certificate in both Event Management and Leadership. Essentially, I crafted a collegiate path that will lead me to achieving my dream of owning my own event management business. I am currently still pursuing this major. One thing about the University of Iowa that I love the most is that it is truly a place where the opportunities and connections are limitless. Although I may have been unsure of my decision to attend the University of Iowa at the beginning of my collegiate career, I can honestly say I know I made the right decision. Since I have arrived to Tippie and the University of Iowa in general, I have been provided opportunity after opportunity, each opening a new door to new ways to further develop my collegiate and professional career as a businesswoman. After almost two full years at the University of Iowa, I am well connected with administration and students at Tippie, actively involved in programs I am passionate about, am regularly invited to attend conferences and galas on behalf of Tippie, have two (almost three) on-campus jobs that give me experience for my future career, and am on track to graduate on time with no debt. It is true that the University has opened the door to many opportunities. However, the successes I have had so far are also my doing. You can find more success than you ever thought possible, but you have to be willing and driven to go out and get it. My advice to anyone who will soon be starting college is to be proactive about your future. Try new things, meet new people, and say “yes” more. Immerse yourself into your college and campus and chances are opportunities will begin presenting themselves left and right. 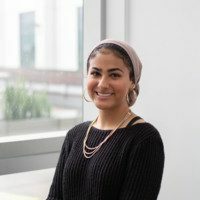 Zahra is a first-generation university student currently in her second year the University of Iowa pursuing her BBA in Management and Entrepreneurship as well as certificates in Event Management and Leadership. She currently works as the Executive Director of the Fine Arts Council, a student-led organization that plans two annual art shows featuring artists from all over the Midwest, and as the Student Program Coordinator for the BizEdge Mentoring Program, an organization that matches first-year, underrepresented business students with accomplished upperclassmen from similar backgrounds to provide peer mentorship. Zahra is also a Peer Mentor for BizEdge and is passionate about the academic and professional development of first-generation underrepresented students.